Earlier this year, commerce platform, Magento was acquired by tech behemoth Adobe for an incredible $1.68 billion. But at the Magento Live Europe event in Barcelona this week, it was clear that the beating rock ‘n’ roll heart of the vibrant open-source community is still very much alive. Before proceedings got a little too close to corporate for comfort, the 1,850 attendees were treated to a keynote speech that restored the balance. 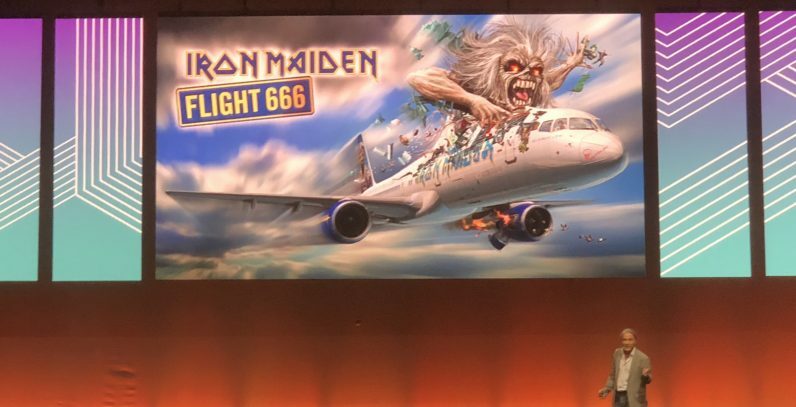 Would Iron Maiden frontman Bruce Dickinson have what it takes to unite an audience consisting of the Magento community, clients, and sponsors? Will my metal hero sell out before my eyes? There was nothing to fear (apart from the dark). There is much more to the multifaceted lead vocalist of Iron Maiden than many realize. As a commercial airline pilot, he piloted Iron Maiden’s customized 747 plane, “Ed Force One,” to concerts in 35 countries back in 2016. The keen entrepreneur is also internationally ranked at the combat sport of fencing, and upon its fifth birthday, Iron Maiden’s Trooper beer had sold over 20 million pints. I can say without hesitation, that Bruce Dickinson is most certainly one of a kind. Dickinson proudly revealed the only phone he uses was what appeared to be a working Nokia 3210 or as he described it as “The phone that made Finland.” Questioning the benefits of digital disruption, he advised that rather than kill the music industry, we have ended up with free music, but a t-shirt that costs a hundred dollars. While sharing a series of successes and failures from both the air and on stage. Dickinson shared his passion for a business venture to develop an edible drone designed to deliver humanitarian aid into inaccessible disaster areas. Nervous laughter was turned into surprise as he advised how it can land within 10 meters of a disaster zone and feed 50+ people. The message was simple. If you can dream it, it might happen, and without a dream, there won’t be any reality. The ability to take chances, think differently, force change, leap into the unknown, is how we all grow. But, how many of us are too afraid to try? For 60 minutes, an audience of digital natives and creatives put down their phone and learned a valuable lesson from the school of rock. The importance of being here and being present. As he exited stage left, many were saying how this was one the best keynotes that had ever seen. Maybe we should all think differently, bigger and leap into the unknown. If only, I could convince him to be guest number 666 on my podcast. But as I left the venue, I was happy with the fact that I had just witnessed something incredibly special, an experience that wasn’t shoppable and it was all the more special for that reason.